Ridelhuber and the Red Elephants would end the 1960 football season at 10-2-1. Under the guidance of the legendary and longtime Woodward Academy’s head coach Graham Hixon, Preston would lead the Red Elephants all the way to the state finals. They would lose to powerhouse Waycross, but the story for Ridelhuber would not end that night. Preston would go on to play QB for Johnny Griffith’s Georgia Bulldogs. In 1964 he would be selected as the Sun Bowl MVP in a victory over Texas Tech. He was drafted by the San Francisco 49ers then was picked up by the home-team Atlanta Falcons. He was injured and released in 1967 but bounced back in 1968 and was picked up by Al Davis & the Oakland Raiders. 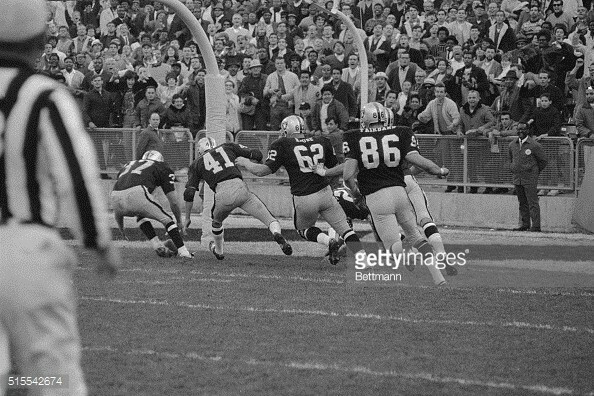 During the 1968 season he took part in and became a footnote in one of the most infamous games in NFL history – the Heidi Game. But that is not all – he scored the final touchdown in that game that over half the nation assumed the New York Jets had won. November 18, 1968, in the 4th quarter of a bitter and heated NY Jets – Oakland Raiders game, NBC made a decision that forever altered how live sporting events are broadcast. In the waning minutes of that game, the Jets had just kicked a field goal and were now winning a thriller 32-29. The Jets kicked off to the Raiders with 1:05 left in the game – just as Oakland fielded the kick – Heidi cut in. Heidi was a TV movie adaption of a children’s book from 1880 about a young girl in the Swiss Alps. As fans on the East coast were treated to a beautiful scene of a young girl walking with her grandfather high in the Alps, Oakland’s Daryle “The Mad Bomber” Lamonica orchestrated a touchdown drive to give Oakland a 36-32 lead. On the ensuing kickoff, the Jets fielded the kickoff – flubbed it – then the ball rolled into the end-zone where our Back of the Week from 1960, Preston Ridlehuber, would cover the ball for a second touchdown in nine seconds. The game was over: Raiders 43 – Jets 32. Why did Ridlehuber’s score matter? As Bill Clinton would say, “It’s the gambling, stupid”. The betting line was Oakland -7.5 points. When NBC left the game to show Heidi, the Jets were winning and covering the point spread as an underdog. After the go ahead touchdown 36-32, the Jets were losing the game but still covering the spread. After the second touchdown in nine seconds, now Oakland won, covered the spread and all those who bet on the Jets lost. In the gambling world this is incredibly exciting and a huge swing with many dollars both won and lost in the final seconds in the most dramatic way possible. With his fumble recovery, Ridlehuber is a both hero and a scourge all wrapped up in one to gamblers everywhere – at the time. The Heidi game remains the most infamous moment in sports television history and yet another fascinating connection to The Touchdown Club of Atlanta.